The Aliens vs. 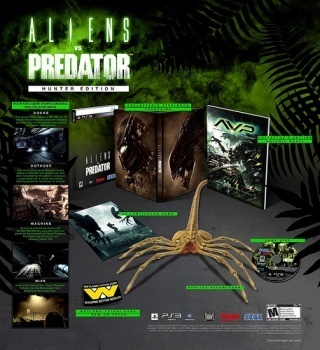 Predator Hunter Edition has been confirmed for release in North America, a sweet set that will include nothing less than a fully articulated Facehugger. After initially announcing the AvP Hunter Edition for the European market, Sega has now revealed that the special edition of the game will also reach American shores. Not only that, it'll actually include just a little bit more than its European cousin. The Hunter Edition will come with four multiplayer maps (in advance of their release to the general public), a Weyland Yutani sleeve badge, a 3-D lenticular postcard and, as an extra, non-European bonus, a hardcover graphic novel featuring the original Dark Horse Aliens vs. Predator comic. But you don't really care about that, do you? No, there's only one thing in this box that's going to convince people to pop some extra bucks for it and that's the Facehugger, "a fully articulated and disturbingly creepy model" of one of moviedom's most famously disgusting oviparians. The piÃ¨ce de rÃ©sistance of the package doesn't appear to be as large as the real thing, but it sure is ugly. Of course, all that awesomeness doesn't come cheaply; Gamestop has the Aliens vs. Predator Hunter Edition listed for a cool hundred bucks, as opposed to $59.99 for the standard edition. And if you're a PC owner, you might want to brace yourself for disappointment: Both Sega and Gamestop currently have the Hunter Edition listed only for the Xbox 360 and PlayStation 3. Aliens vs. Predator is scheduled for release in February 2010.